Jeffrey Alexander is Professor of Sociology at the University of California, Los Angeles. His most recent books are Fin-de-Siècle Social Theory: Relativism, Reduction, and the Problem of Reason (1995), Neofunctionalism and After (1998), and Cultural Trauma (forthcoming). Robert N. Bellah is Elliott Professor of Sociology, Emeritus, at the University of California, Berkeley. Among many awards and honors, he is a recipient of the National Humanities Medal. John A. Coleman, S.J., is Charles Casassa Professor of Social Values at Loyola Marymount University, where he teaches in the Law School and the Department of Sociology. Among his books are The Evolution of Dutch Catholicism, An American Strategic Theology, and One Hundred Years of Catholic Social Teaching. He is currently doing research on Catholic Charities USA, as part of a study of religion and welfare. Harvey Cox is Victor S. Thomas Professor of Divinity at Harvard University, where he teaches both at the Divinity School and in the Program on the Study of Religion in the Faculty of Arts and Sciences. His book The Secular City (1965) was recently selected by the Faculty of Marburg University as one of the two most decisive books in Protestant theology in the twentieth century. S.N. Eisenstadt is Professor Emeritus at the Hebrew University of Jerusalem. He has also been a visiting professor at numerous universities, a member of many scientific academies, a recipient of honorary doctoral degrees of the Universities of Tel Aviv and Helsinki and Harvard University, a recipient of the International Balzan Prize, the McIver Award of the American Sociological Association, the Israel Prize and Rothschild Prize in Social Sciences, and the Max Planck Research Award. Nina Eliasoph is Assistant Professor in the Department of Sociology at the University of Wisconsin-Madison and author of Avoiding Politics: How Americans Produce Apathy in Everyday Life. She is currently working on an ethnographic study exploring political conversation and moral education between children and adults. Philip S. Gorski is Assistant Professor of Sociology at the University of Wisconsin-Madison. His current research focuses on the relationship between religion and politics in early modern Europe. He is completing a book titled The Disciplinary Revolution: Calvinism, Confessionalism and the Growth of State Power, to be published by the University of Chicago Press. Stanley Hauerwas is Gilbert T. Rowe Professor of Theological Ethics at the Divinity School of Duke University. His most recent book is Sanctify Them in the Truth: Holiness Exemplified. Richard Madsen is Professor of Sociology at the University of California, San Diego. Besides being the coauthor of Habits of the Heart and The Good Society, he is the author of five books on various aspects of morality, religion, and society in Chinese societies. Albert Jordy Raboteau teaches in the Religion Department at Princeton University. He is the Henry W. Putnam Professor of Religion and has served as chair of his department and as Dean of the Princeton University Graduate School. He taught at the University of California, Berkeley, and served there with Robert Bellah on an interdepartmental committee for the Program in Religious Studies. His field is religions of the Americas, with a specialization in the religious history of African Americans. His books include Slave Religion, A Fire in the Bones, and African-American Religion (a high school text). He is the coeditor with David Wills of African-American Religion: A Documentary History. Steve Sherwood is a graduate student in the Department of Sociology at University of California, Los Angeles. His areas of interest include narrative theory, religious and cultural sociology, and the sociology of artists. Publications include "Narrating the Social: Postmodernism and the Drama of Democracy" (1994) and "Theorizing the Enigma: The Problem of the Soul in Durkheim's 'Elementary Forms of the Religious Life'" (1998). William M. Sullivan is Professor of Philosophy at La Salle University and Senior Scholar at the Carnegie Foundation for the Advancement of Teaching. He is the author of Work and Integrity and a coauthor of Habits of the Heart and The Good Society. Ann Swidler is Professor of Sociology at the University of California, Berkeley. She is a coauthor of Habits of the Heart and The Good Society, as well as of Inequality by Design (Princeton University Press, 1996). Her most recent book is Talk of Love: How Middle Americans Use Their Culture (University of Chicago Press, 2001). Charles Taylor is Professor of Political Science and Philosophy, Emeritus, at McGill University, Montreal, Canada. Steven M. Tipton is Director of the Graduate Division of Religion and Professor of Sociology at Emory University and its Candler School of Theology. He is currently working on Public Pulpits, a study of religious advocacy in Washington. Robert Wuthnow is the Gerhard R. Andlinger '52 Professor of Sociology and Director of the Center for the Study of Religion at Princeton University. He is the author of numerous books, including After Heaven: Spirituality in America since the 1950s (University of California Press, 1998) and Loose Connections: Joining Together in America's Fragmented Communities (Harvard University Press, 1998). Deepening and developing the seminal vision of Habits of the Heart (California, 1985), this volume presents original essays by leading thinkers in the social sciences, philosophy, and religion. Richard Madsen is Professor of Sociology at the University of California, San Diego. He is the author of five books, including China's Catholics (California, 1999). William M. Sullivan is Professor of Philosophy at La Salle University and Senior Scholar at the Carnegie Foundation for the Advancement of Teaching. He is the author of Work and Integrity: The Crisis and Promise of Professionalism in America (1995). Ann Swidler is Professor of Sociology at the University of California, Berkeley. Her most recent book is Talk of Love: How Culture Matters (2001). Steven M. Tipton is Director of the Graduate Division of Religion and Professor of Sociology at Emory University and its Candler School of Theology. He is at work on Public Pulpits, a study of religious advocacy in Washington. All four editors are the coauthors, with Robert N. Bellah, of Habits of the Heart and The Good Society. 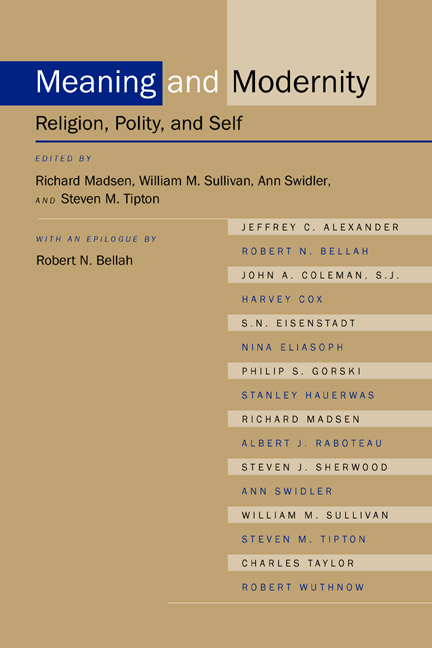 "This interesting volume of essays on contemporary religion and its ambivalent relationship to modernity not only serves as a testimony to the intellectual influence of Robert Bellah, it establishes a new school of comparative religious and social thought. This Bellahian school--at the intersection of sociological, theological, and contemporary philosophical thinking--has roots in Durkheim and Weber, borrows insights from Marx, Foucault, and Bourdieu, and finds its clearest voice in the writings of Bellah himself. The essays by some of Bellah's colleagues and former students that have been gathered in this volume address some of the most sagacious of these Bellahian themes: the religious dimension of contemporary civil societies, the relationship between religious and capitalist values, the cultural critique of modernity, and the moral visions that hold a promise of civic renewal. "—Mark Juergensmeyer, author of Terror in the Mind of God: The Global Rise of Religious Violence (California, 2000). by John A. Coleman, S.J.